A patient with macular edema, or with exudate in the macula, will usually experience some loss of vision, including blurring, distortion, and darkening. If one eye is affected, the other eye is frequently affected also, though the problem may not be equally severe in both eyes. 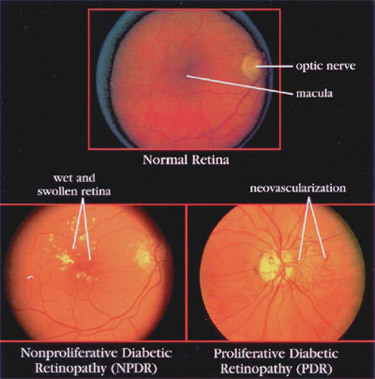 If the diabetic retinopathy has affected each macula severely, central vision may be lost from each eye. But even if the ability to see detail has been lost from both eyes, the person with severe NPDR will usually be able to get along fairly well by learning to use the areas just outside of the macula to see more detail. This ability to look slightly off center usually improves with time, though the eyesight will never be as good as it was before the macula was damaged by the leakage of blood vessels. So patient who have severe NDPR will usually be able to see well enough to take care of themselves and continue those activities that do not require detail vision.